Like me, you probably didn't make it to the World Of Concrete trade show in Las Vegas. But this is OK, we still have news on some new tools from Bosch that add to their growing cordless line. Both tools are in the 18 volt Litheon line, the first being a 4-1/2" Angle Grinder, and the second is an SDS-Plus Rotary Hammer. The Bosch Litheon line is ever growing, but it still has a ways to go to catch up to Makita. Bosch looks to be doing things right with the new CAG180 Angle Grinder as it is said to be the most powerful grinder on the market today; which means these battles between companies make us all winners. Some improvements over the competition include a higher top speed of 10,000 RPM's, and the best performance-to-weight ratio in its class. Bosch uses electronic cell protection (ECP) combined with electronic motor protection (EMP) that they say provides "unmatched battery run time and 2 times longer lifetime ". One of the coolest features, is also something that can also be found in the newer Bosch corded angle grinders, and that is something they call Restart Protection. Restart Protection will prevent the tool from running while in the On position after the power has been cut off. So lets say you run the grinder until the battery dies, and you leave the tool on. When you replace the battery, you will have to turn it off and then on again to get it to run. Very smart. 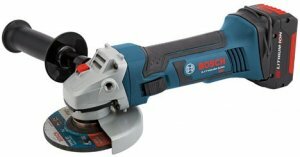 Oh how I love cordless rotary hammers, and the Bosch RHH180 SDS-Plus will likely be no exception. When I installed doors I dreamed of the day I would own one, thus preventing me from taking 100' of extension cord to each and every door when I had to install door stops or thresholds. The RHH180 shares many of the same features as the CAG180 Angle Grinder, such as ECP & EMP, but it also uses a much different brushless motor. Bosch probably chose a brushless motor because of the added protection it would provide for the dusty environment the tool would likely be in. The power-to weight ratio on the Rotary Hammer is also very good, and weighs in at only 5.7 lbs and has a 3/4" drill size capacity. Another nice touch is the added LED light, which should be a standard by now on every power tool made. Both the [:cicn:] CAG180 Angle Grinder (around $400 Amazon) and the [:cicn:] RHH180 Rotary Hammer (around $500 Amazon) can be purchased as a kit with 2 FatPack batteries and a 30-minute charger, or as tool only as the [:cicn:] CAG180B (around $210 Amazon) & [:cicn:] RHH180B (around $230 Amazon).